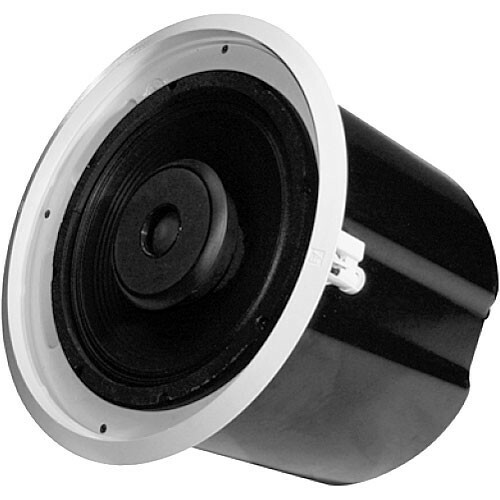 The Electro-Voice EVID C12.2 is a passive 12" in-ceiling loudspeaker system with a multi-tap transformer designed to deliver reliable voice and music reproduction in waiting rooms, offices, retail stores, restaurants, and more. When driven by your 70V, 100V, or 8-Ohm power amplifier (available separately), this two-way speaker provides a power capacity of 100W RMS. The EVID C12.2 is equipped with a 12" coaxial transducer capable of efficiently covering frequencies from 85 Hz to 18 kHz. An internal 2 kHz network ensures bandwidth distribution to the speaker components. The built-in 64W transformer offers automatic saturation compensation, and accommodates a range of taps, selectable via a convenient switch on the ABS baffle. The removable Euroblock connector, tile bridge, mounting ring, cutout template, and paint shield contribute to easy installation. The EVID C12.2 includes an integrated 3/8" threaded rod and pendant mount rigging points if you have an open ceiling. If you're working in a drop ceiling environment, the included tile bridge and mounting ring ensures easy and secure installation. The 64W built-in transformer comes with automatic saturation compensation for 70V/100V operation. The transformer tap switch is conveniently located on the speaker's baffle. The rear enclosure is made of heavy-gauge steel and painted black so it disappears into the background. It also provides an optimal internal volume for extended low-frequency performance.